Whittington Press: "The Whittington Press has, since 1971, been printing books by Letterpress, from type …, in the Gloucestershire village of Whittington. It was started by John & Rosalind Randle partly as the result of an early enthusiasm for Caslon Type, Albion Presses and handmade paper." 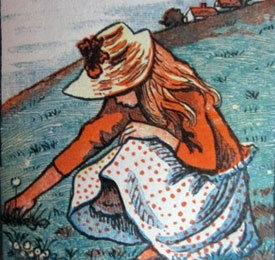 Miriam Macgregor has been a regular contributor to Whittington publications since 1977. Single prints of some of her woodcuts are available. Click here to check what's available. Risbury, Herefordshire, England: Whittington Press, 2011. Edition of 100. 7 x 10.5"; 27 pages. Printed "in the main" for family and friends in Caslon type on Amherst handmade paper (c.1899, now with some signs of age). Edition of 100: 50 deluxe, 50 standard. Standard: Pamphlet bound in Fabriano Roma papers. Frontispiece photo image of Mavis Lowndes tipped in. In navy blue paper slipcase. Signed. Unnumbered. Whittington Press: "This short book is based on the account of his mother’s life that John Randle gave at her funeral in 2008. Printed in the main for family and friends.... It is printed on the last of the small stock of paper made for Lord Amherst in 1898, containing his magnificent coat of arms as its watermark, which we acquired from Oxford University Press in 1986." Mavis Lowndes was a World War II war widow. She began a business as a dressmaker to support herself and young son. Through her life she had a talent for making friends and maintaining friendships. A Talent of Friendship is simply and no less than a quietly lovely memorial by a son to his mother. Andoversford, England: Whittington Press, 2008. Edition of 225. 8.125 x 11.75 x 1.5"; 40 pages. Printed on Somerset and Zerkall geglättet mould made papers. Type: 24 point Stephenson Blake Caslon. Original prints drawn on a tablet then digitally printed by the artist. Accordion fold with endpages as pastedowns. Bound in paper-covered matching illustrated boards. 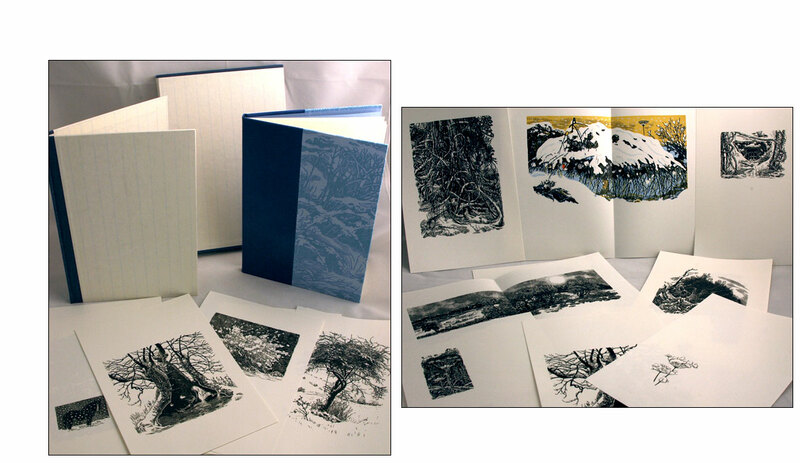 Edition of 225: 165 in slipcase; 60 in solander box with set of signed prints and poster. 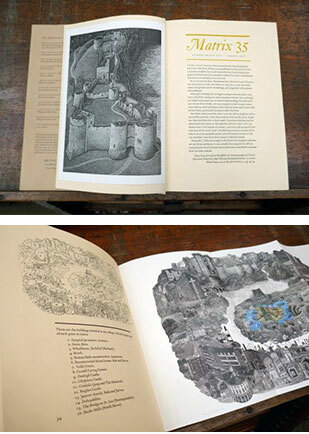 Whittington Press: "The images in this startling book are unlike anything the Press has attempted before. Drawn on an electronic tablet and printed on a digital printer, their brilliance and inventiveness perfectly mirror the atmosphere of Portmeirion, the extraordinary Italianate village built by the eccentric architect Clough Williams-Ellis on a remote peninsula in North Wales. Clough’s grandson, Robin Llywelyn, who spent much of his childhood with his grandparents at Portmeirion, has written short but evocative texts about each of Leslie Gerry’s seven images of the village. 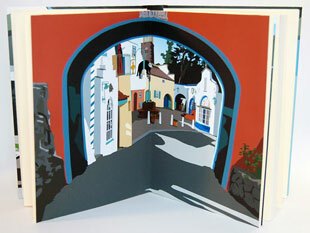 The unusual conception and binding of Portmeirion is a tribute to the genius of Williams-Ellis, who continued the building of Portmeirion until well into his eighties, and its complexities have delayed the publication of the book by several months – just as one imagines Williams-Ellis’ designs must have delayed the builders of Portmeirion. We have seldom had such an enthusiastic reception as the one we have had to Portmeirion." Herefordshire, England: Whittington Press, 2010. Edition of 725. 7.75 x 11.25 x .825"; 124 pages of which 118 are numbered. Set in Van Dijck, Walbaum, Univers Light, Joanna, Poltawski, Gill Sans, Bell, and Caslon. Printed on Somerville Laid and Zerkall mould-made papers. Illustrations: photos, woodcuts, samples. Of the edition of 725: 655 in stiff covers; 70 quarter-bound in Oasis leather and marbled paper with a portfolio of additional material. This is the stiff covers edition. Contains the following articles/essays: Barbara Henry on Dale Guild Type foundry; Catherine Dixon and Henrique Nardi on "Letterpress from the Street: Grafica Fidalga, Sao Paulo"; Geri Waddington on "French Papermakers and other House Guests"; David Godine on "David Godine: the Letterpress Years"; John Smith on "Pied Sorts and Squint Chases"; Ross Shaw on "It Takes All Types - The Occasional Print Club"; Mauro Chiabrando on "A Century of Futurist Typography"; John Randle on "Michael Richey: Two Encounters"; John G. Kristensen on "Buttonhooks for a Brave New World"; Jerry Kelly on "The Quiet Ones"; Jesse Marsolais on "A Boy at Firefly Press"; Colin Franklin on "In a Golden Age of Publishing"; John Randle on "Jacek Agopsowicz, 1947-2010"; Tanya Schmoller on "Tschichold Arrives at Victoria, 17.6.47"; Alan Powers on "Robert Harling in the 1930s"; Sebastian Carter on "Hunt Roman"; Jerry Kelly on "Fine Printing at the Stinehour Press, 1950 - 2008"; Paul W. Nash on "Private Press Books 2009: A Review"; book reviews by Robert Elwall, Gaylord Schanilec, James Clough, and John Randle; and John Randle on "'Bookish Treasures Have a Hard Time Competing with the Framed Village Dog Show.'" Herefordshire, England: Whittington Press, 2012. Edition of 660. 7.75 x 11.25 x .75"; 144 pages of which 127 are numbered. Letterpress printed. Tip-ins and fold outs. Set in Bell, Bodoni, Goudy Modern, Arrighi, Romulus, Poliphilus. Fournier and Caslon types. Printed on Somerville Laid & Zerkall mould made paper. Case bound in light boards. Printed dust wrapper. Edition of 660: 600 standard; 60 deluxe. Herefordshire, England: Whittington Press, 2018. Edition of 660. 11 x 7.25"; 176 pages. Print process: letterpress, offset, and digital. Set in Gill Sans, Univers Light, Caslon, Modern No. 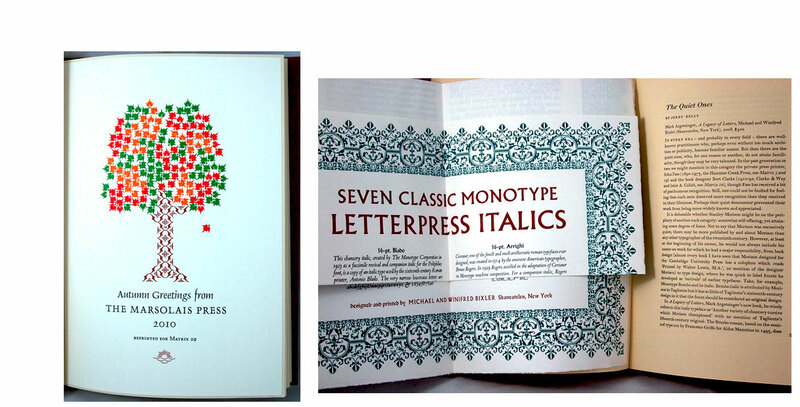 I, Perpetua, Goudy Modern, Van Dijck, Cochin, Bodoni, Times Roman, Walbaum & Poliphilus types. Printed on Matrix Laid, Zerkall, and Bugra Butten mould-made, Fedrigani Tintoretto & Naturalis papers. Bound in stiff covers. In printed wrapper. Whittington Press: "Matrix 35 breaks our golden rule of ignoring the outpourings of the Whittington Press: there is a telling account of the collecting of our posters and ephemera; and images from some recently discovered 35mm film recording the installation of the Wharfedale Press through the end of the building in 1974. Other topics include printers’ social life in Minneapolis in the ’80s, living and working in the Gill household at Pigotts in 1939, travels in Afghanistan, roofing in 6-point Gill Sans, and an engraver’s collage of buildings from the Iron Age to City skyscrapers. 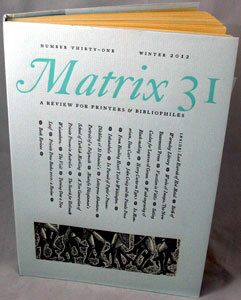 "Matrix 34 seemed in retrospect a little short of other printers’ work, and we have addressed this here with inserts printed by a number of other printers, as well as a good scattering of wood-engravings, linocuts and colour plates, with the text printed in a wide range of Monotype founts including Goudy Modern, Cochin, Van Dyck, Bodoni, Walbaum, Gill, Caslon, Univers, Perpetua, and Times, a continuing celebration of Morison’s legacy at Monotype, now dating back almost a century." Contents: A Tale of Two Collections by Sophie Schneideman; Rambles in Letterpress by Alan Brignull; With the Gills at Pigotts by Clemency Stanes; White Line, Black Line by John Craig; The Bodoni Museum by Michael Daniell; Catterson-Smith’s ‘Little Job’ by William S. Peterson; Kliluk: Creating an Asemic Alphabet by Barbara Henry; The Kliluk Project at Swamp Press by Ed Rayher; Peter Scupham, Poet-Bookseller by George Ramsden; The House where Phil Lived by Rob Rulon-Miller; Doing the Odd Linocut by Frances Fineran; A Tale and its Unfolding, the Final Instalment: Kickshaws at La Maison des Mots by John Crombie; David Wakefield’s Type Lore by Miles Wigfield; A Young Craftsman at Daneway by Simon Verity; Afghanistan – a Journey by Peter Chasseaud; Typographical Architecture by Otto Gobey; Ina Bandy’s Photographs of Matisse by John Bidwell; Star Attraction: Dunbar Hay by Alan Powers; Collecting Whittington Posters by James Freemantle; Ageing and Building by Hilary Paynter; The Allamanda Press by Paul Hatcher; Spanning the Decades: Eighty Years at OUP by Andrew Schuller; A Typefounder’s Diary by Nick Gill; Stanley Lane in conversation with Sheila Markham; Moving in the Wharfedale by John Randle; Book Reviews by Jerry Kelly, Patrick Randle, and John Randle. Risbury,Herefordshire, England: Whittington Press, 2012. 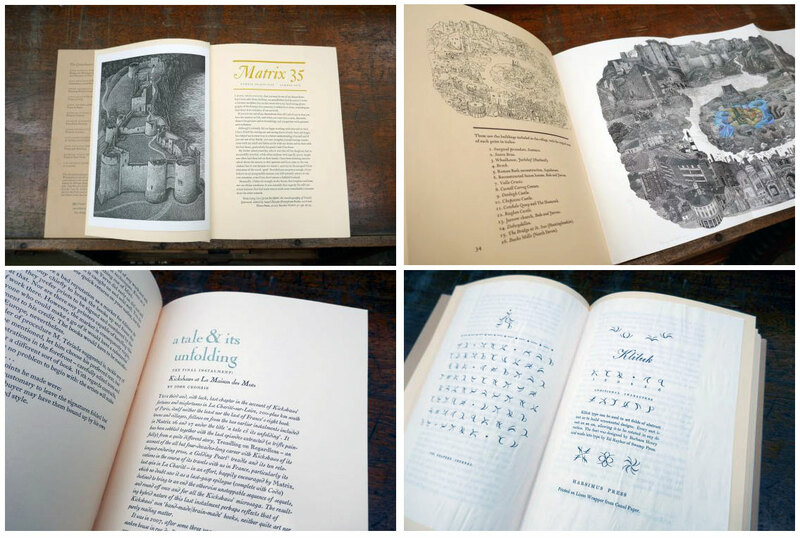 Edition of 265 in three versions. 10.5 x 7.5"; 32 pages. Printed in 14-point Bell on Zerkall mould-made paper. 24 wood engravings. Signed by the artist. Edition of 265 in three versions. Full bound in leather (out of print); half bound in leather (out of print); full bound in paper. 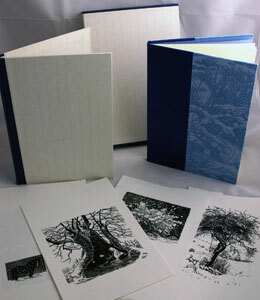 Whittington Press: "In February 2009 the north Cotswolds were covered by a brief but deep fall of snow. A fairytale landscape of changing shapes and patters appeared overnight, and beside the predictable snowman on the village green a habitable igloo even appeared. Miriam Macgregor ventured out into this unfamiliar snowscape with sketchbook and camera, and these engravings, mostly full-page, are the perfect subject for the medium." Of the edition, 185 copies are bound in patterned papers and slipcased. This version is still available. Risbury, Herefordshire, England: Whittington Press, 2011. Edition of 300. 10 x 7"; 80 pages. Set in 12-point Caslon type. Printed from the original engravings on the three different papers made by Joseph Batchelor & Son to the original specifications of William Morris. Colophon: "Some of the paper is the best part of a century old, and some sheets may bear the patina of age. The different formats of each edition reflect the slightly different sizes of each of the three papers." Edition of 300: 160 Standard, 100 deluxe, 40 special. Standard: Printed on the Crown and Sceptre paper. Half-bound in Fabriano Ingress papers. Slipcased. Deluxe: Printed on the Flower paper made for the Kelmscott Press. 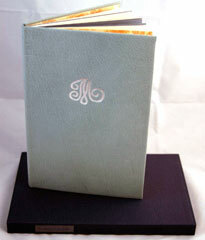 Half bound in Oasis leather and pre-war Fabriano Ingres. 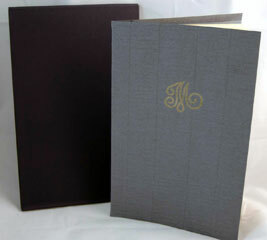 Contains the proofs and an additional engraving in a separate cased portfolio. In single slipcase. 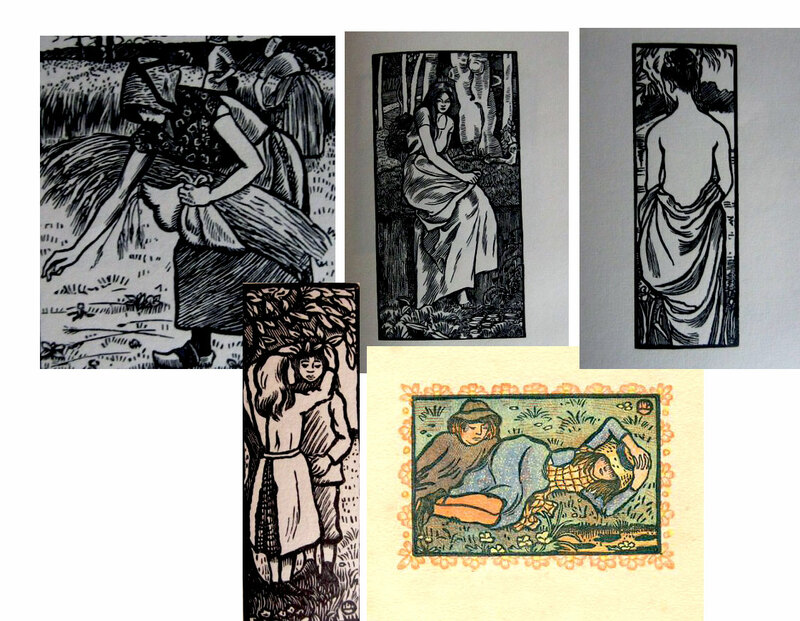 Whittington Press: "The selection of these twenty-four wood-engravings by Lucien Pissarro, mostly done for his Eragny Press, is based on a pastoral theme, at which he excelled. They are printed from the original boxwood blocks, kindly lent to us by the Ashmolean Museum, and printed on some of the last remaining stock of Joseph Batchelor’s hand-made paper, made to William Morris’ specification, some of which has been generously given to us by the Morgan Library and Museum in New York, where it has lain for over a century. "The book contains an introduction by John Bidwell on the origins of the Batchelor paper, and a memoir by Miriam Macgregor of her grandfather, the artist Archie Macgregor, Pissarro’s close friend and neighbour." Risbury, Herefordshire, England: The Whittington Press, 2017. 12.5 x 12.5"; 128 images, 16 numbered pages, title page, half title, colophon. Images printed on Tintoretto paper. Text printed in 14-point Cochin on Hahnemühle mould-made paper. Edition of 275: 230 copies half-bound in buckram with paper sides decorated with a pochoir image by Peter Allen, coloured endpapers, in a slipcase; 45 copies similarly bound in Oasis leather, and an accompanying portfolio of six original unused photographic prints, in a leather-backed solander box. Numbered. 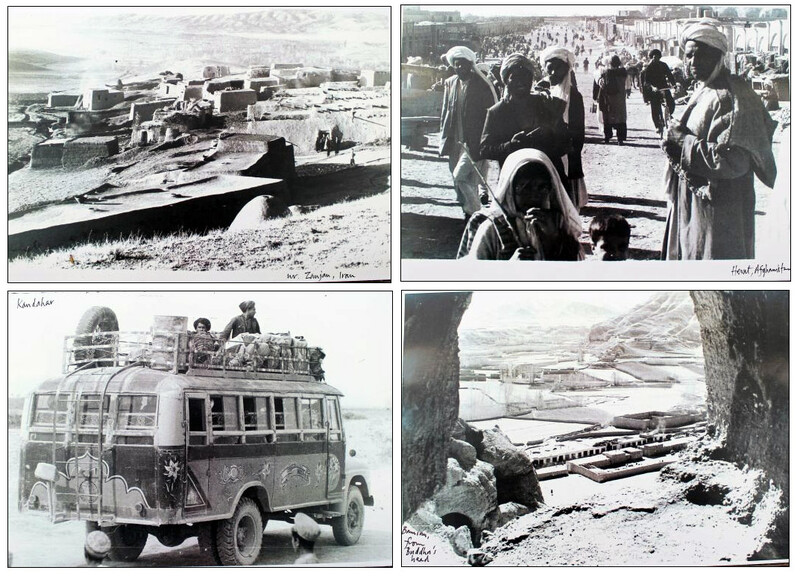 Whittington Press: "Once upon a time it was possible to drive from England to India, in the days when there was a Shah in Persia and a King in Afghanistan, and the Khyber Pass was still negotiable. A succession of Land Rovers, VW Campervans, and in one case a Mercedes bus still advertising its destination in Berlin, made the journey in the sixties and early seventies until revolutions and invasions put an end to such adventures. John Randle made the journey with two friends in a Land Rover over a period of six months in 1968/9, taking with him his newly acquired 35mm Canon SLR camera and returning with some three thousand images taken along the way. "On return he spent many hours in the darkroom enlarging a small selection of them onto 12 x 10" Agfa Brovira paper (the same size that they are printed in this book) and for some forty years they accompanied the Randles, and the Whittington Press, from London to Andoversford to Marston, and were then stored away and largely forgotten. 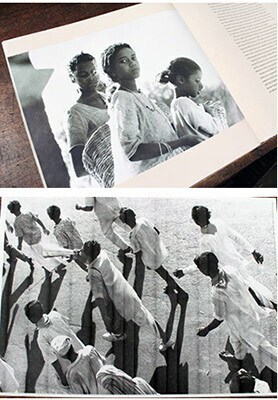 "Cartier-Bresson remarked that our final image is the printed one, and finally the economics and image quality of short-run digital reproduction made possible the publication of these 128 images, recording life as observed in Romania, Afghanistan, India, Nepal, Ceylon, and elsewhere. They freeze events at what Cartier-Bresson named The Decisive Moment, when subject and composition are in conjunction for a fleeting second, the negative is exposed, and the caravan moves on. Descriptive captions attempt to explain the context and whereabouts of each image, but in the main the images are left to speak for themselves." Risbury, Herefordshire: Whittington Press, 2011. Edition of 185. 15.5 x 22"; 68 pages. Letterpress printed. Set in 18 and 20 point Caslon. Printed on a heavyweight Zerkall mould-made and Ingres papers. Of the edition of 185: 150 standard, 35 deluxe. Standard: Bound in paper illustrated boards with quarter buckram. Titles in gilt on leather spine label. 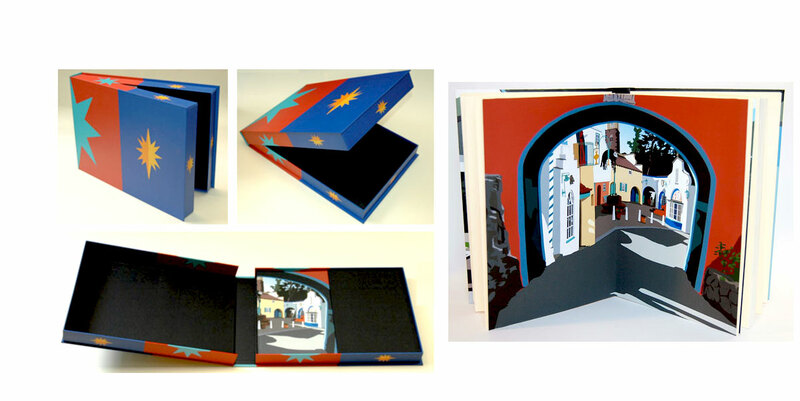 Housed in matching gatefold wrap with tie closure. Deluxe(out of print): Bound in paper over boards with leather spine. With a portfolio of a selection of prints, including The Rock of Cashel, nine sheets joined together to form an image measuring 4.5 x 3 feet. Housed in clamshell box with titles in gilt on leather spine label. 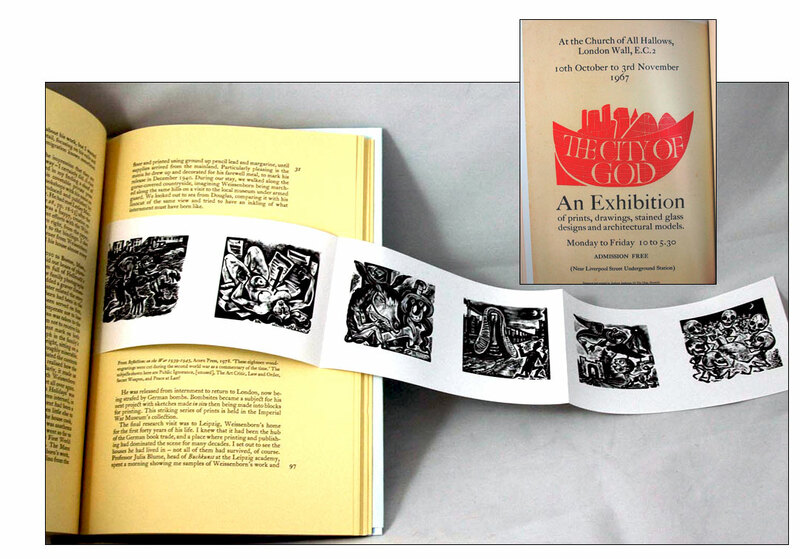 A Vision of Order Includes 35 linocuts by Anderson, with his commentaries on the images. The large format allows most of the prints to be tipped in unfolded. Whittington Press: "Andrew Anderson's astonishing linocuts are an arresting mix of image, lettering and symbolism. 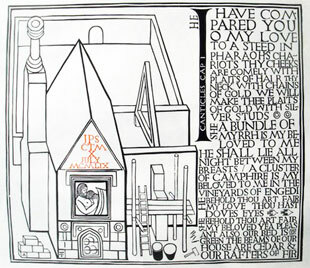 The images show strong influences of his background as an architect with a particular interest in mediaeval architecture; the lettering brings Eric Gill to mind, but with an added fluency and versatility; and much of the symbolism comes from his involvement with cathedral and church architecture. 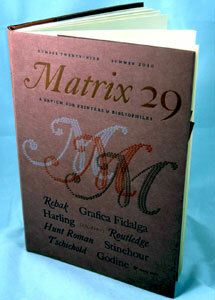 He has written about his work in MATRIX 28, pp. 9-14. "He combines these three elements with immense skill and with a rare dedication, and yet his images have an astonishing vibrance and magnetism. Little known or seen over the years, hampered perhaps because of their size and the artist's preoccupation with his architectural work, they appear here for the first time in a readily accessible form, each with a note by the artist explaining its content and symbolism." Andrew Anderson, introduction: "The cuts fall into five groups: (1) plain inscriptions, which were among the first to be done; (2) imagined cities; (3) love poems - courting couples dallying in orchards and beds; (4) country churches; and (5) historic hymns and verses celebrating the age-old festivals of the Christian Year. There are two designs for Christmas cards, a wedding invitation, the front of a house with three windows and a door (an early linocut from my student days), a Crucifixion, lines from a poem by Charles Williams, and a Noah's Ark. "I am an architect, not an artist. The oblique viewpoint in many of the cuts – geometrical projections of the kind used in architectural drawings to explain buildings – shows this. "